We like it, so we decided to share some experiences with you. Installation is easy as with any WordPress plugin, just copy it to plugins folder and activate from administration. You are presented with Shopp welcome page and brief explanation. Shop, Cart, Checkout and Orders pages are created automatically, so when you’re finished with initial setup, add some products and you’re ready to sell. I was really impressed how much work is made on usability of this software. 99% of things are clear instantly. Shop capabilities are really great. 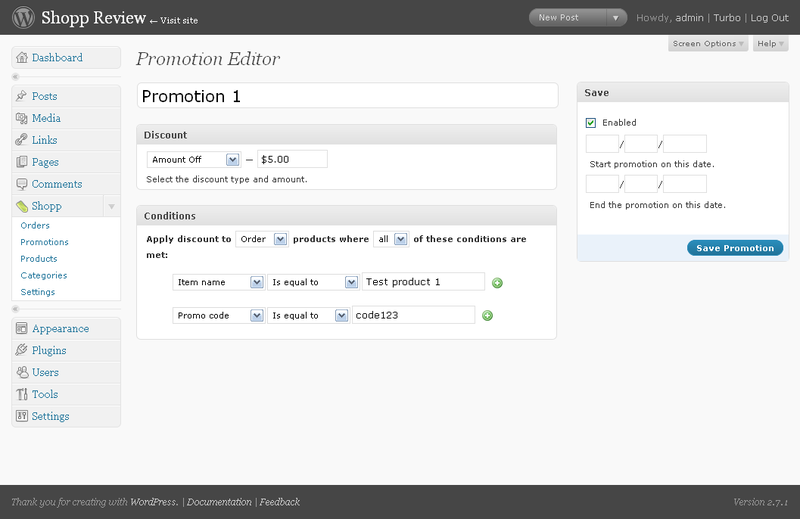 You got shipped, download, donation product types with price variation capabilities, can easily manipulate shipping and taxes and apply promo codes and discounts. I especially liked how promotions are done. 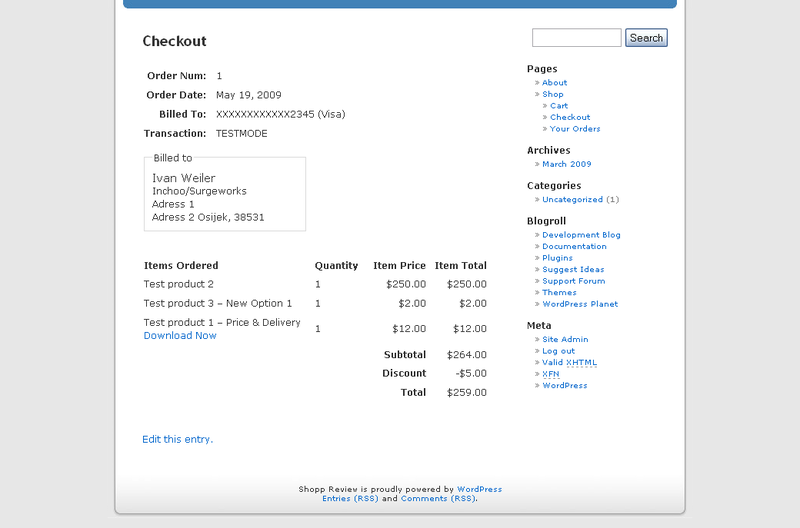 Core Shopp comes with GoogleCheckout and PayPalExpress external checkouts, while real gateways are sold separately. Currently there are Authorize.Net, eWay, FirstData, HSBC ePayments, iDEAL Mollie, PayPal Pro payment gateways and UPS Service Rates which is shipping module. 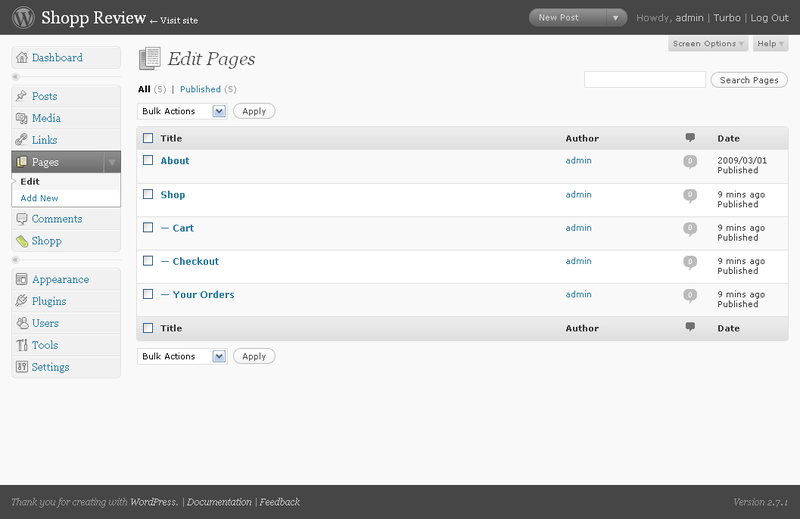 Administration is designed in WordPress style and more. Predefined pages are more then enough for start, however Shopp got some serious theming capabilities through its presentation settings, shortcodes, widgets, template tags etc. Templates can be automatically copied to your theme folder and customized from there. It also uses (but not misuses) modern ajax tricks like form validations, grid/list view and built in lighbox. I rarely see the product that is so easy to use and got everything at the right place. It’s ready to use out of the box with minimal settings and knowledge. Things like presentation setting and similar features are surely developed with this in mind. 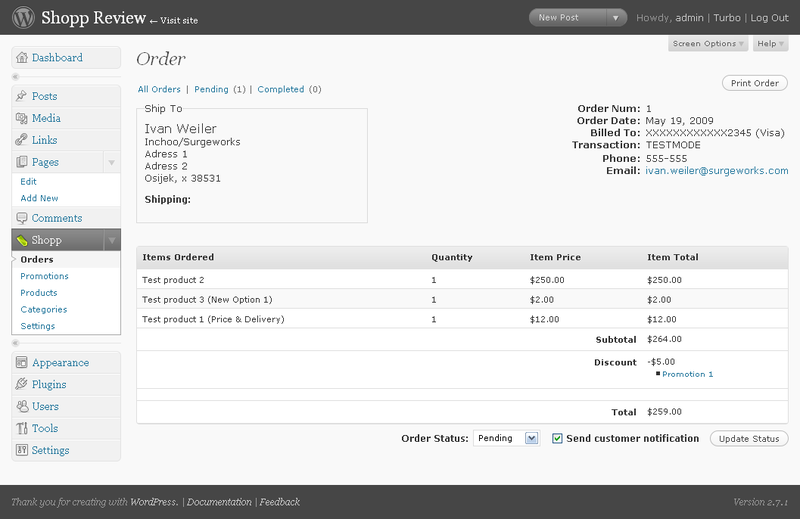 Great Test mode options for payment gateway stuff, code is clean, well structured and commented. 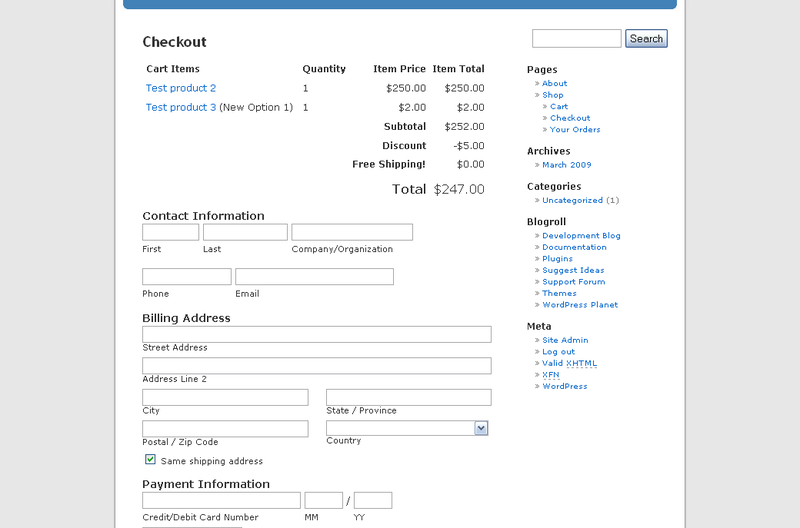 I was, for example, able to develop subscription (recurring billing) add-on without any core modification. Small bugs, for example Continue Editing when adding new product doesn’t work for me or, i can’t say it’s a bug really, but i was expecting to see product in my shop before i categorized it. 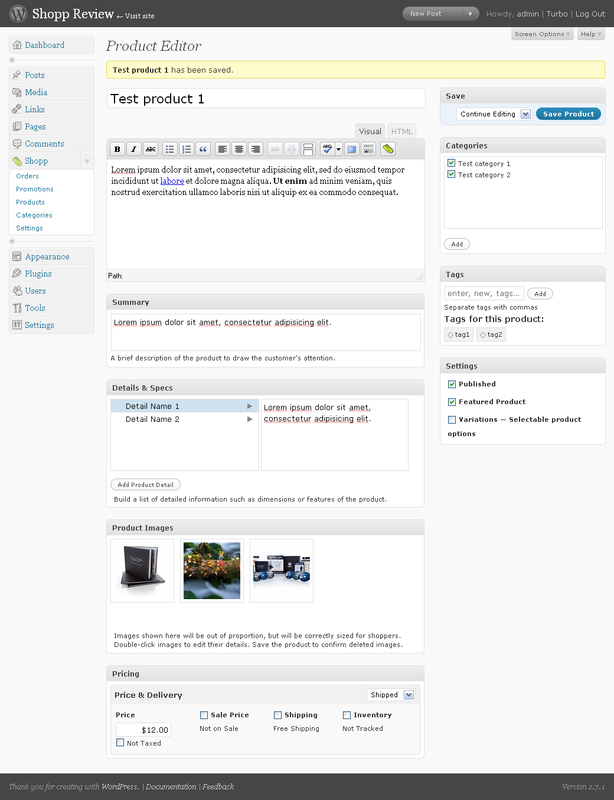 Note that in the past Shopp bugs was mostly related with running WordPress on non-Linux servers. In my experience author provides great support. There is also official forum and maintained documentation at nice looking web site that really grasp look and feel of this great plugin. We ended up writing our own complete shopping cart (it’s so customised to the client that I could never release it), it was the only way I could get all the features I wanted and the recurring payment solution in place. Yes – I was wondering the same thing (a year later, haha) — the code you used to develop a recurring payment solution, could you post that somewhere? You mention you developed a recurring payment solution, is this freely available or is the source code all viewable so it’s easy to create modules and tweaks? I have to agree, this product is definately more polished and is worth the $55 per site..
WP eCommerce is also good plugin and although is free, most of its additional gateways and usability addons also aren’t. In my opinion Shopp is more polished, both visually and under the hood. 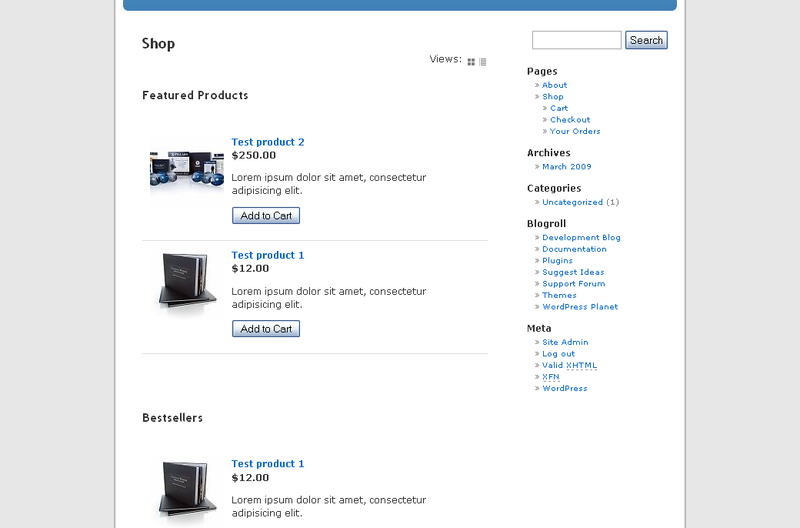 Have you looked at the free WP eCommerce plugin from Instinct? If you did, how do these two compare?